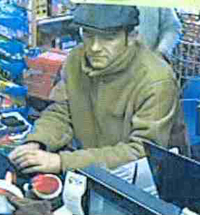 Shops in Lincolnshire are being warned to look out for a man after carrying out a number of national rent card scams. The man (pictured right) has so far stolen thousands of pounds in cash throughout the UK, and he may be working with other people. The original warning comes from Gwent Police, where in their operating area he conned five different shops out of £2200 in just over five days last November. The man undertakes his scam by going to the shop and requesting his rent card to be topped up with around £440. However, the card is actually a clone linked to a pre-pay mastercard. When the person behind the till tops up the fraudulent rent card at a Pay Point Terminal, the man will pay for the top up on his bank card, but it is declined. He then says he will go and get the money from a cash point to pay, but never returns. Meanwhile, he can now withdraw the money from the fake rent card. The man in question has been described as having an Eastern European accent, and shops should keep an eye out for him or anyone else who may be trying to pull of the scam. If you recognise the man, call Gwent Police on 01633 838111 or Crimestoppers anonymously on 0800 555 111. Any fraudulent activity should be forwarded to Lincolnshire Police on 101.